Editor’s note: Program Officer for Eurasia on Freedom House's Emergency Assistance Program. The views expressed are the writer’s own. During a complex, fast-moving crisis such as the one now unfolding in Ukraine, it is tempting for some commentators to advocate taking the “long view.” This school of thought, which carries more than a whiff of Cold War nostalgia, reduces the struggle for Ukraine to a geopolitical game in which the various competing actors – the United States, the European Union and Russia – become featureless billiard balls ricocheting off each other. Ukraine becomes Russia’s “historical backyard,” or even worse, a subordinate part of its “legitimate sphere of influence” which we are urged to respect. Approaching the unfolding Ukrainian crisis in this way has the advantage of appearing sober, practical, and dispassionate. It is also dead wrong. It is wrong because it treats Putin’s Russia, the European Union, and the United States as equivalent actors on the world stage – opposites, but equally legitimate – when in actual fact, these countries’ systems of government are profoundly different. Russia is undemocratic, authoritarian, and endemically corrupt, its natural resources and immense human capital plundered by Putin and his regime. The European Union, for all its considerable flaws, is a collection of open, liberal, democratic states, respectful of human rights and beholden to the rule of law. A worldview that equates these actors and condemns Ukraine as fated to be split between them in a kind of Solomonic compromise is deeply cynical. Moreover, it is precisely the worldview of Vladimir Putin. And that is not a worldview that we can afford to adopt. The protesters on Kiev’s Maidan and across Ukraine’s towns and cities did not brave the cold, the truncheons and the snipers because they have any great love for Brussels, or because they yearn to be in Europe’s “sphere of influence.” They did so because the abrogated association agreement represented an aspiration to turn away from Soviet systems of governance and develop Ukraine’s democratic institutions: an impartial, independent judiciary, a police force that protects its citizens, and an accountable government in which corrupt officials are exposed and punished, rather than allowed rob their people blind. To Putin, similarly, Ukraine is not so much part of a historic sphere of influence as it is a bulwark against those transformations. Viktor Yanukovych’s inglorious departure exposed to the world how a corrupt leader can amass impossible riches in a bankrupt country where over a quarter of the population lives below the poverty line. The images of his opulence – a gaudy, palatial estate featuring a golf course, a classic car collection and a private zoo – are only a superficial embarrassment compared to what Ukrainian journalists digging through reams of previously secret documents will likely uncover. This is why the protesters came to the Maidan – both from Ukraine’s west and from its “pro-Russian” east. The word for “corruption” in both Ukrainian and Russian, as it turns out, is almost the same. Naturally, no such public revelations will unfold in Russia while Putin remains in the Kremlin, just as none were possible while the Yanukovych regime was in power. Putin, we know, was watching, and the thought of independent journalists poring through his documents and gawking at his palace in the North Caucasus must be a sobering one. His regime – founded on misinformation, corruption, and naked power – is only a larger and more frightening version of Yanukovych’s. And if it ends, he fears, it will end in the same way. Both Russia and Ukraine inherited the pathologies of the Soviet Union, which made such grand corruption possible. Only the development of modern democratic institutions can address this, the most fundamental grievance of the post-Soviet world. The struggle to develop these institutions and to make them sustainable is long and difficult – almost impossibly so. Ukraine’s previous pro-Western government, swept into power by the Orange Revolution, failed this challenge. Crucial reforms went unimplemented. Corruption remained endemic. The economy stagnated. And soon enough, this government, too, was swept out of power. Is Ukraine’s new pro-Western government ready to succeed where its previous one failed? Putin’s goal is almost certainly to ensure that it fails, leaving the country what it was: a small, pathetic clone of his kleptocracy. To do this, he has sent in Russian troops under laughable pretexts and provocateurs to stir up ethnic nationalism; he has unleashed the full might of his propaganda machine and raised the specter of fascism; he has lauded people waving the Russian tricolor in Ukraine while bundling anti-war protesters waving the same flag in Moscow into police vans. Bringing the Russian police state to Ukraine is not a legitimate exercise of Russia’s influence. 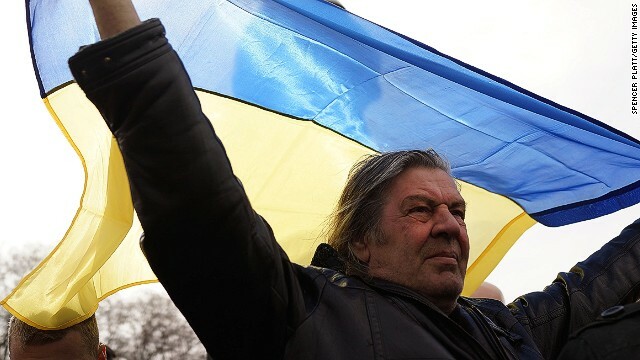 It is an aggressive attempt to ensure that the new Ukraine repeats the mistakes of the old. Yet if Ukraine’s new pro-Western government is ready to succeed, it is incumbent on the West to stand with them, not cower behind a more comfortable and historically palatable pretext. The focus must be not on placating Putin, but on helping Ukraine build institutions that will ensure respect for human rights, a fair market economy, and compliance with international norms. It is not by accommodating the most odious regimes, but by strengthening the most promising, that global liberal democratic norms will be advanced. So that one day, freedom will come not just to Kiev, Donetsk, or Sevastopol – but to Moscow. Next entry »What I'm reading: Will Russia make a play in Kazakhstan? Surely not a game,games are funny,this is more like russian roulette. Thank you, RFN. How true that is! Don't forget about our taking over both Iraq and Afghanistan and we have the nerve to chastise the Russians. How ludicrous! Try getting some facts before you post. That would be a novel idea. Russia signed AWAY Crimea many years ago, with a signed agreement with Ukraine, in exchange for assorted advantages including shipping and port rights. So this most recent travesty is Russia breaking its own signed agreement. I was working all day so no internet for me. Has Russia's Putin "annexed" anything today yet? Since we're so preoccupied with history why doesn't Russia cede their territority back to the Mongols? At least give them Eastern Russia. Or hell perhaps we should starting thinking back to the clovis people and where they fit in all of this? In case you guys forgot, where Russia put it's paw, the people suffer and struggle for living. You better be thankful for having such a neighbor as America. God bless USA! Gee Richard, how do you expect God to bless the U.S.A. while we keep on butchering people in the Middle East and Central Asia with our ungodly drones and Apache helicopters? Please Richard, kindly quit with that mumbo-jumbo over how "great" we Americans are! Actually, we're no better that the Russians or anyone else! You very much sound like you deserve to live in the "new" Russian Crimea. You don't sound deserving of the largess of the USA that I am quit sure you partake of. The Ultimate Hypocrite. Yes, Richard, so Ukraine should also me greatful to the US politicians for having arranged and paid for the "revolution" and all the innocent people who died on Maidan? That's a fact that you can not change. Do you think the US government have a right to interfere into other countries affairs just like that? The US played the Ukraine. Together with the EU they promised to Ukraine mountains of gold and an opportunity to join the EU. Things which will never come true. The EU already has Greece, Spain and other insolvent countries. everyone knows they do not need Ukraine as part of EU. SO why pomising something you can never make true? Why paying a group of people for destabilizing the situation inside a country that has nothing to do with you? According to you it should be like this? And then after damage had been done, everyone, the US, the EU pretended that they cared. They cared, however, they did not care to investigate into those snipers' shootings. If it weren't for the phone conversation leak, no one would do anything. They care, however, they supported the nazist in the newly elected government in the Ukraine, in the heart of Europe. This is unspeakable! I can not judge wether what Russia did was right or not. But neither can the US or Europe, considering the whole world recognized Kosovo, and US and EU were among them. If the Kosovo case was "right", how is the Crimea's case different? Legally the situations are identical. So there really exist double standards. Only Russia does not play with other countries. Zach,when Russia left Aghanistan, Cuba, Angola, they dumped them for survival. US, on the other hand, has been doing a lot to help repair and bring back normal life in the countries they had military operations. BIG difference and something for you to think about. You're right, Richard. The big difference here is that we killed far more people than the Russians did! If that's what it takes to gain respect in the world, I'm for it! Do residents of, say, New York State have the legal right to vote to have New York State become part of Canada? --–And does the Canadian government then have the jurisdictional right to move Troops and Tanks to the borders of New York State to "protect" this voter election? - And then does Canada have the right to declare that New York State now is part of Canada and therefore subject to Canadian laws and Canadian military? To all the war-mongers out there, I have one request. Please – please do not start talking about making war unless you are willing to do what it takes to win ... because, if you don't fight to win ... you won't. All these references to WWII ... let's ask why we won that war. The Big Three (Roosevelt, Churchill, and Stalin) consulted several times during the war. And every time they talked, they reaffirmed the same agreement: That nothing less than Unconditional Surrender would be accepted. Now think about that a minute. Germany surrendered on May 8, 1945. Question: What if they hadn't surrendered until June 1st? Answer: We would have kept on killing Germans another three weeks. Question: What if they hadn't surrendered at all? Answer: We would have killed them all ... every last man, woman, and child. To win you must be ready-willing-able-and fully intend to commit genocide. As long as the enemy doubts your ability AND YOUR RESOLVE to do exactly that, he will not quit. You must convince him that you are going to liquidate his entire people, and there's not a d- thing he can do to stop you. This is what it takes to win. And this is why we did not win in Korea ... why we did not win in Vietnam ... and it is the reason we are not going to win in Afghanistan. On the other hand m, we did everything we could do to win in Vietnam except drop the atom bomb and that was because Richard Nixon thought it very unwise to kill our own P.O.W. 's in North Vietnam. It's a very good thing that he didn't as it would have blackened this country's name beyond redemption! I disagree. LBJ was the Pres. when I was in uniform and he was in office for the bulk of the VN War. We did not do everything possible. We could have invaded North VN any time we wanted to, which would have effectively taken the war completely out of South VN. But LBJ was afraid of China, just like Truman was in 1950. Truman called Korea a "Limited War with Limited Objectives." He imposed Rules of Engagement ... forbid McArthur to cross the 38th Parallel ... and did not authorize the use of the Atomic bomb. LBJ did essentially the same thing with VN ... me made it a Limited War, too. And the end result was the same. Korea was a stalemate but Vietnam was a defeat. m, the main reason that North Vietnam wasn't invaded was because Pres. Johnson well remembered what happened to the French at Dien Bien Phu in 1954 and didn't want the same thing to happen to the Americans. Besides, it was Sec. of Defense Robert S. McNamara who also recomended against the invasion of North Vietnam because it was he who feared the Russians. The bottom line here is that we never had any business in Vietnam in the first place. It was all politics! The US has no say in chastising Russia for this. Keep in mind we invaded the sovereign nation of Iraq on a lie. Also, we simply can't afford a war with Russia. I think that we should fix our problems at home first, but that's my opinion. Joe, you're an idiot. The the US the the most powerful country in the world, and everyone want's our help. We can invade whomever we wish, lie or no lie. NObama needs to do something manly for a change and invade Russia and let that Commie Putin know he can't have the Ukraine, and he better get on the US's good side real quick. Ans we should not be afraid to start WW3 if we need to. Sigh, if only our sorry excuse for a president had the guts like a real man, like Bush. Can't wait until we have a decent white Chirstian man as a President again!! Only a stupid, crazy fool thinks that we can survive WW3, Southerngent. This is the only reason that neither the United States, Great Britain nor France have ever attacked Russia after WW2 inasmuch as they coveted their vast territory. Then again, people have been trying to conquer Russia for ceturies on end, the last people to succeed were the Tartars in 1240 AD. Since then, ever other invader has failed. Learn you history as well as your physics or did you ever go to high school in the first place? CNN is censoring the latest out of Ukraine where the MP sitting on the Freedom of Information committee and 5 thugs assaulted a TV station manager for showing Putin's speech. Those thugs beat him into signing a resignation letter and even filmed it and it is getting all kinds of hits on youtube. Thank you, Tupperhouse for the informative post. We need more people like you to keep us informed since the right-wing media fails so miserably at it! Indeed, we are at a dangerous crossroad brought on by inattention and weak signals by Washington and the President. A strong foreign policy by the United States minimizes the chance of armed conflict in the world. A weak foreign policy invites aggression. Plain and simple. Now, Mr. Obama is forced to react with limited options to a situation he partially helped create. Good grief citizenatlarge1, what an ignorant comment the above is! Quite the contrary, our only too aggressive foreign policies are currently creating 80% of the world's problems and you seem to want yet more bloodshed! Look at what's happening in Iraq now! I wish the author had mentioned Russia with ther perm seat on the UN Security Council. In any case, Crimea is a special case beause of the russian naval base at Sevastopol. The US and EU understand this and it is why the real issue hasn't been the annexation of Crimea istelf but how it was done. IF..a big IF Putin starts meddling in Eastern Ukraine then the EU/US will have to decide whether it'll "walk the walk"